Have a question we haven’t answered in our other pages? Look for it here in our FAQs. Pursuant to Senate Bill 60 (SB60) of the 2013 Regular Session of the Nevada Legislature, effective October 1, 2013, any registered agent with 10 or less represented entities is considered a registered agent. Pursuant to Senate Bill 60 (SB60) of the 2013 Regular Session of the Nevada Legislature, effective October 1, 2013, any registered agent with 10 or more represented entities is considered a commercial registered agent. A Commercial Registered Agent form must be on file with the Nevada Secretary of State. A Commercial Registered Agent must post standard business hours and standard business hours for acceptance of service. A Statutory Agent is one in the same as a Commercial Registered Agent. Pursuant to Senate Bill 60 (SB60) of the 2013 Regular Session of the Nevada Legislature, effective October 1, 2013, any registered agent with 10 or more represented entities is considered a commercial registered agent. A Commercial Registered Agent form must be on file with the Nevada Secretary of State. A Commercial Registered Agent must post standard business hours and standard business hours for acceptance of service. How do I know what kind of agency I need to form? This question is best answered by an accountant or attorney. Depending on why you are setting up an entity in the State of Nevada and its purpose, your legal /accounting team will help determine the entity type that will best suit your needs. Once the type has been determined, State Agent and Transfer can accommodate the filing on your behalf. Why am I required to have a Registered Agent? The State of Nevada requires all entities to be represented by either self with a Nevada address. If one cannot provide such an address, State Agent and Transfer signs the acceptance of Registered Agent to provide such an address to comply with the Statute of Nevada. We also supply our address for those who wish to keep their personal information off of the public record which helps reduce solicitation and mail box inundation. 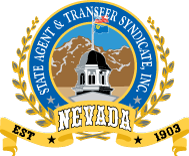 State Agent and Transfer Syndicate, Inc. and Capital Tax Solutions work together to provide clients with the best Tax Service and Registered Agent services for their businesses. Nevada is an ideal home for your business due to its business friendly statutes. Nevada’s corporation law is codified so to be very favorable to the formation and operation of your business. Nevada has no reciprocity agreement with the Internal Revenue Service. This means that Nevada provides no information to the IRS with reference to your company. Nevada has no individual or corporate income taxes and no franchise fees. It, therefore, collects no income information.